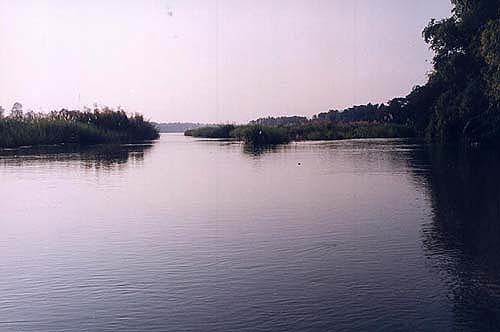 The Ping River flows quietly by while bird's sing and insects never stop their high pitch chorus. It is warm and cloudy this July day with a few drops of rain darting into the river. I come here every day to sit and just let my thoughts flow through my mind much like the river flowing past me. Everyday is different and the same. Different in as much as it may not be raining, or there will be different sounds, but it is still the same. 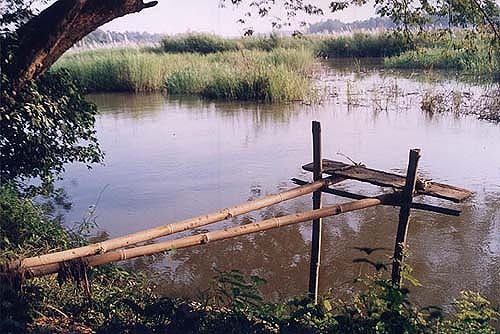 There are no office buildings to look at, and no traffic jams to wait in, just the river grass and the water to look at. Yet in my mind and in my thoughts, as much as I try to not have any thoughts, there are mental connections to a life on this plane of existence that is very far from here. Here is the small village called Bangta-ngai in Banphot Phisai central Thailand, and what is very far from here is half way around the planet in San Francisco, California or Boston, Massachusetts, or Paris, France, all cities in which I have lived. However, it is my virtual connection in the United States with my on-line web presence and on-line business that occupies so much of my mental time. People anywhere in the world can visit my virtual world at http://www.earthportals.com. It is on Earth Portals I attempt to lay down a tapestry of interconnectedness for conscious evolution. I try to find, as Dane Rudhyar, the astrologer, told me to do many years ago;"go find my own tone". What tone was Rudhyar telling me to look for? What tone was he speaking of? I believe the tone to be the quiet tone. A tone untouched by turbulence and from that undisturbed space could come the manifestation of a grand purpose in life. For me this is a kind of work which I feel is necessary to provide for people using the internet so that there is a sense of harmony inside the virtual world accessed through Earth Portals. Through Earth Portals it is possible to leave the everyday world, and travel to the center of the galaxy and beyond. Bringing purpose to that ability to journey afar is a reality that can be born out of that non-turbulent space, quiet space, still space, or mindful state. And how quiet is it here on the Ping River? It is very quiet. Wat Mongthongsathit is behind me and the sound of monks chanting filters through the tress as does the occasional truck noise slipping through the banana trees from the road in front of the Wat. But, directly in front of me, and a little below me, is the Ping River quietly moving southward. Other than that there is only an occasional bird breaking the silence, or a fly resting on my arm. This has become existence for me, and has been such for over two years. Everyday I come to this spot, and everyday itÕs the same. The river has been here an eternity as have the tress and the birds. It is the same, but always changing. And what ripple disturbs the water? A fish jumps through its roof as the sun jumps down from between the clouds, or the chanting of monks sneaks around the bamboo trees. And then like some unannounced intruder comes the construction of thoughts, which dictates movement of the physical body to transmit these words though my pencil. In my mind's eye friends appear and disappear. Images of anything can come about in an instance and become a part of this seamless quiet landscape if only for a brief moment. If I could melt what I know to be all those thoughts that need melting I would push them right into the Ping River. I would just send those thoughts on their way. But this moment, although being captured by my pencil, is also a fleeting moment. Something is pushing the river, something is pushing my pencil, something is pushing my blood and something is pushing my thoughts. In fact something is pushing everything from the ant finding my writing tablet to the wind pushing the leaves, to the sounds coming from the birds. To where is everything being moved? Does the movement repeat itself, or does a destination arrive where we know why we have been pushed? Now coming though the air are the pushed sounds from a loud speaker on a food cart announcing the price of vegetables mixed with a medley of Thai songs. The daily food truck winds it way through the dirt river road pushing food for all the village people. I do have to get up from this river edge, and I do have to move to another spot. It would be impossible to just sit here day in and day out perpetually moving like the river. But, the river moves from here daily and yet it is still here. Perhaps I too can always be here, but forever moving. 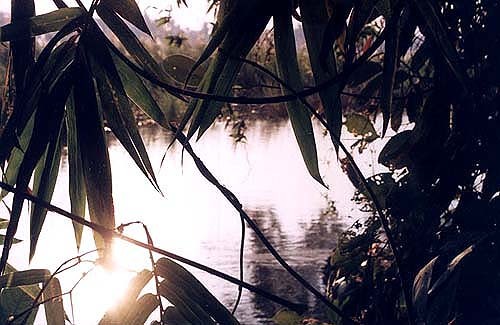 Bringing any thoughts to this quiet place on the Ping River or allowing any thought to occur seems like an intrusion. But, since I have moved here I do carry with me many thoughts. Giving my thoughts their identities is the most fascinating event of all. Perhaps the identity I would give these thoughts would make the realities behind the thoughts a reality unto themselves. My four-month-old baby in the womb for example is now ten years old, or my business in America employs 100 people and is extremely successful. My writings have also appeared in the media and in intellectual journals and other circles of inquisitiveness. But the truth, as reality dictates it, is that my business in America has only one employee, my child will not be born for another five months, and my writings have barely surfaced into the mainstream. I finally got up and moved like the river. Now I am sitting in front of the Buddha at Wat Mongthongsathit. I made my three prayer bows, and now I am sitting in a cool temple with many Buddhas, and the life of the Buddha is painted across the walls. My life has changed significantly because this is where Suwanna, my wife, comes to pay respect and it will be the temple my child will be taught in. This is, after all, Thailand, and the Thais honor the Buddha. In America it is business as usual, and that is a reality that always demands another level of attention. How could I bring the river and the Buddha to my business? And likewise, how do I bring my business to the river and the Buddha? Perhaps the two are mutually exclusive, and what I have created is a reality that speaks to the truth of the need for more simplicity in my live. That tone of an undisturbed space needs to be nurtured within this dual world of Buddhism and economics. Where lies the answer to this query of combining Buddhism and economic? Next to the Buddha mural are depicted the mystery of the various states of enlightenment. Following the Buddha, I have come to learn, is no simple task. Having a mind to absorb the teachings of Buddha, and achieve an understanding of the ways of the Buddha has occupied a great deal of my time. Of late, however, I have come to learn that there may be more behind the Buddha's teachings than meets the eye. It very well may be the Buddha incarnated on earth to re-kindle the lost knowledge of the ancients. It may be that something more profound is being offered here with the teachings of the Buddha. This I have come to learn, and it is this new awareness of stillness that I have to integrate into the river of thoughts that are in my mind. It may be we are as a species ascending into a new domain of awareness augmented by forces as large as our galaxy. It may be this new sense of understanding is what I need to bring to the attention of others. Somehow, I need to couple my awareness with my reality, and leave behind older notions of reality. A new dawn is upon all of humanity, and communicating that must become my priority. 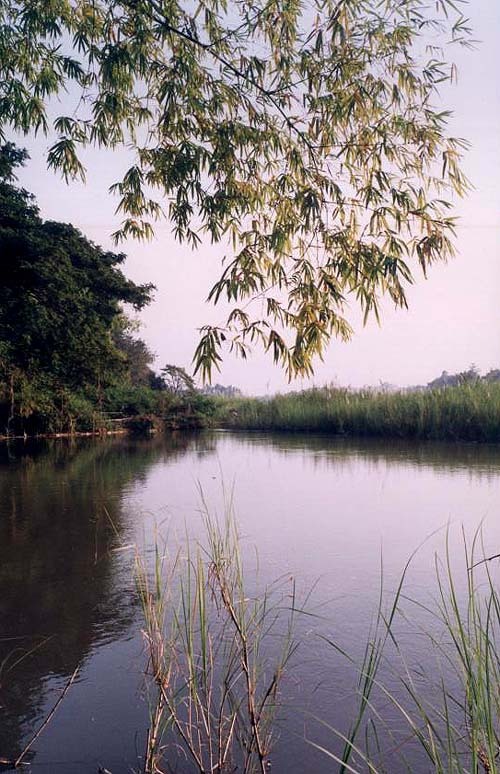 So, as the river passes by in stillness, and the Buddha sits in his profoundly serene state of eternal bliss and composure, I could do no better than if I could impart those same qualities of beingness to others. Faith, Magic and the Spirit of Brahma - The Recognition, Destruction and Restoration of the Erawan Shrine - May 23, 2006. Rat For Dinner? - A delicacy of Thai cuisine - January 2003. 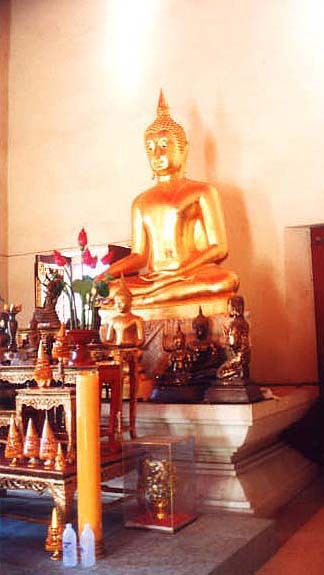 Listen to the Chanting - Short story in Thailand - March 2001.